KANNAPOLIS, N.C. (August 25 , 2014) -- The Kannapolis Intimidators have teamed up with Walmart to host Back to School Night on Friday, Aug. 29, featuring a school tools donation. 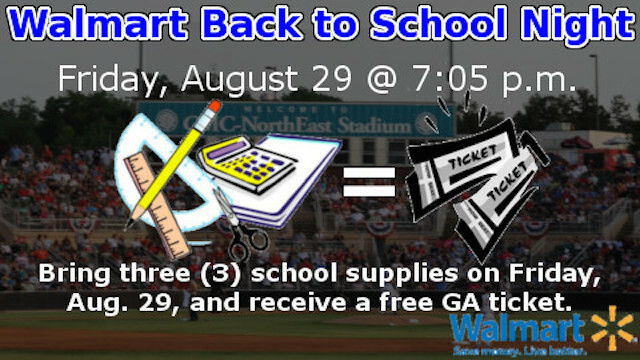 Fans that donate three (3) school supplies at the Box Office will receive a free general admission ticket to that night's game against the Greensboro Grasshoppers. Gates open at 6 p.m. with first pitch at 7:05 p.m.
School supplies will be donated to Communities in Schools North Carolina. The Intimidators are proud to team up with Walmart for this promotion. Area Walmart stores are encouraging customers to "Build A Backpack" for elementary, middle and high school students as the new school year gets underway. Items collected through this drive will then be distributed to public school students in need.